I am struck by this image by Isaac Brekken recently published (article) alongside an article about early voting in the US elections by the New York Times. The article by Jennifer Steinhauer looks at early voting in the US and includes other photos by multiple photographers. On top of being a fantastic photo aesthetically, the complexity it shows so clearly is fascinating. What it seems to reveal is the at times blunt pairing of capitalism, materialism and democracy in the United States. 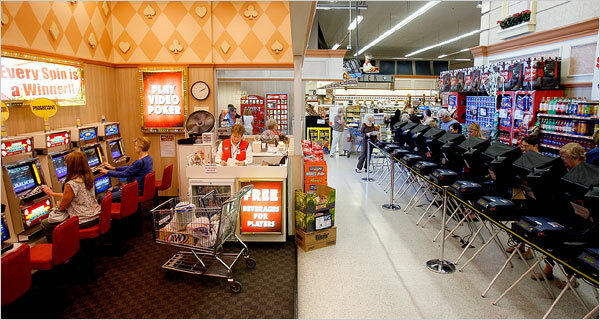 In the same space you can shop, cast your early vote, and then step over to the slot machines to try your luck. It is of course in Las Vegas, which has a distinct legal and commercial environment, but it forces so many questions to the surface about the culture of this place and the United States in general. Is this what we want in our societies? That democracy and the right to vote becomes a banality only facilitated through commercial space? It highlights that for many people, the idea of a public, civic space that guides a democratic and political process has been completely eroded. The government no longer has widespread representation through architecture and urban space, but rather is hidden within the vast network of privatized and commercialized environments sprawling across the country. Without a White House, and the state legislature buildings, what would be left of civic space? It is worth looking at Brekken’s other images. He is based in Las Vegas and covers the (what one could consider superficial) things that absorb the city.